Address: El Castillo, 1, Playa Blanca (Lanzarote), Islas Canarias. Hotel THe Volcán Lanzarote is located next to Lanzarote’s Marina Rubicón Port and 900 metres from Playa Blanca. It offers 5 swimming pools, a spa and a gym. Free WiFi is available throughout. All large, air-conditioned rooms at the Volcán Hotel have a separate seating area. They offer views of the marina or the pool and gardens. Satellite TV is provided in all units. The hotel features an adults-only area called Club Volcán, with exclusive rooms offering special treatments and services. The hotel has 4 restaurants, serving a range of international food. There is also a poolside bar where you can get a snack or a drink. The Lanzarote’s spa features a hot tub, a water bubble bed and Turkish bath. You can also use nearby tennis and paddle courts for free. 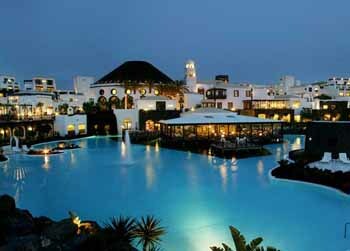 Hotel THe Volcán Lanzarote is 10 km from Timanfaya National Park and 30 minutes away from the international airport of Arrecife. Please inform Hotel THe Volcán Lanzarote in advance of your expected arrival time. You can use the Special Requests box when booking, or contact the property directly with the contact details provided in your confirmation. Guests are required to show a photo identification and credit card upon check-in. Please note that all Special Requests are subject to availability and additional charges may apply. Please, only guests from 18 years old and over can stay in the rooms for adults only. Please note the property consider children guests up to 12 years old.